We find all the OHES team to be professional, highly skilled, and enjoyable people to work with, who always make time for us when we need them. Dan Jones at OHES provided me with good practical advice from both technical and commercial standpoints, he was able to utilise his personal experience and the knowledge base of the wider OHES business to provide strong evidence based opinions. Contaminated Land can present numerous commercial, technical and legal challenges all of which generate uncertainty, cost and delay when land is being bought, sold or redeveloped. OHES strongly believes that the key to managing land affected by contamination, and the successful completion of any land development project, comes from straightforward, concise and timely advice which quantifies risks and delivers value. Where contamination is identified we are able to remediate contaminated soils and groundwater. All works are validated and our comprehensive but clear reports have attracted much praise from clients and regulators alike. For clients with a portfolio of operational sites we are able to undertake a full risk review which examines contamination status of the sites, infrastructure and environmental risks from current operations and combines this with environmental setting to produce a risk ranking of all sites. This information can be used to manage and improve assets whilst reducing risk of contaminating land and prosecution and fines for environmental damage. Without doubt, a significant area of strength is our ability to be responsive. We are frequently asked to perform environmental due diligence surveys and submit reports with very tight deadlines usually at the very final stage of a major acquisition. We are trusted advisors to our clients during this often confidential process and we add great value through our ability to resource these projects with high calibre staff who appreciate the urgency of the situation and the commercial significance of the information and opinion we provide. 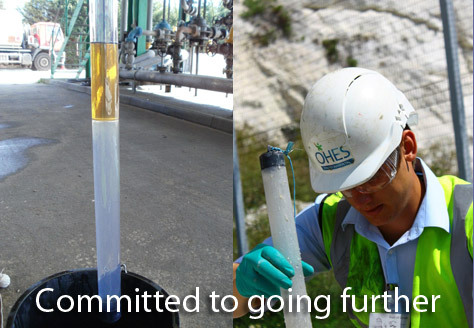 With decades of collective experience gained from providing advice to the fuel/oil, property and industrial sectors and a pro-active and innovative approach, OHES possesses the dedication, skills and tools to deliver the advice you need to balance and minimise your environmental risks and optimise the value of your project.